Love reading? Well, hopefully, this guide will help you get your reading on! I present to you a few recommendations for all that concerns reading- where to buy your books, how to choose your next read and where you can resell your books. With summer around the corner, its time to get some books ready! While there are many bookstores in Leiden, my all-time favorite is Mayflower Bookshop. You must have passed it at some point, with the iconic tricycle full of books parked up front. This charming bookstore offers a wide selection of titles in English, including some second hand, and there’s always a discount of 3 books for 20 euros. 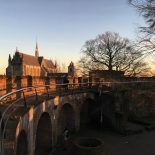 Buying books outside of Leiden? If you’re willing to go a bit further, I’d recommend visiting New English Bookstore in Amsterdam for books ranging from 5-6 euros, all in new condition. The American Book Center in Amsterdam and The Hague is also an option, but the prices tend to e higher in these stores. While there are many websites that ship books (bol.com, Amazon, etc.) a relatively unknown one is https://www.bookdepository.com/. The books are in English and prices are usually cheaper than what you’d find in the bookstores. You can even find some study books here, which may be cheaper than you’d find in other places. The website has a “Bargain Shop” where you get even bigger discounts on books, and the best part is that they offer FREE WORLDWIDE SHIPPING, no minimum order. What I love the most is that all books arrive with a special bookmark to get you motivated and never fail to bring a smile to your face. The books usually take about 8-9 days to arrive, sometimes faster. If you’re not sure what you feel like reading, here are a few websites for you to try. Just choose which option applies most to you and go check them out! I want to explore, unbiased– Check out https://www.recommendmeabook.com/. This website allows you to read the first page of a book without knowing its author or title. It’s the perfect way to really decide by the writing style and the characters, rather than judging the books by their cover. I want a similar book to one I already read– If you really liked a book and looking for a similar one try this website: https://www.whatshouldireadnext.com/index.php. All you need to do is fill in the book you read and you’ll receive a list of recommendations. If you want to sell your books for a small sum you can go to either Mayflower Bookshop or Boekhandel De Kler b.v. (which is on the opposite side of the street). Don’t expect more than a few coins, however. Another option is to give away your books for free (which you can do in any second-hand store), sell them on Facebook, or, of course, keep them. This entry was posted on April 10, 2019 by Maya Orbach in Leiden, Leisure, Maya, Practical Stuff.